Wedding season is in full swing, and the weather has been glorious – perfect for beautifully fragrant, colourful bouquets of summer flowers. I’m excited to share some of the weddings I’ve been working on soon, but today I want to celebrate one of my favourite summer flowers: the peony. We’re pretty much at the end of peony season now, which is always a slightly sad time as they’re just so gorgeous! This summer has been a wonderful year for them though, with late May to early July being the time they’re at their best. The peony has been a sought after bloom among brides for years, and they’re certainly not a fad flower. Soft and elegant yet big, bold and blousy at the same time, this beautifully sweet and somehow timelessly elegant flower adds a real wow to any bouquet. Part of the reason I love to use peonies is their texture. The delicate ruffles of the petals add a really sculptural finish to bouquets and arrangements, and the colour palette of the peony means they can either form a beautiful backdrop of whites, creams and blushes when used in abundance, or else they give a punchy accent in corals, deep pinks and reds. Timing with peonies can be tricky, as they don’t show off their full ruffled glory immediately. Order them too early and you risk overblown petals in your bouquet, pick them too late and they’ll be tightly wound little buds. Heat plays a big part in the speed at which the flowers open, so once purchased they need to be carefully tended and looked after to make sure they’re at their best on the big day. 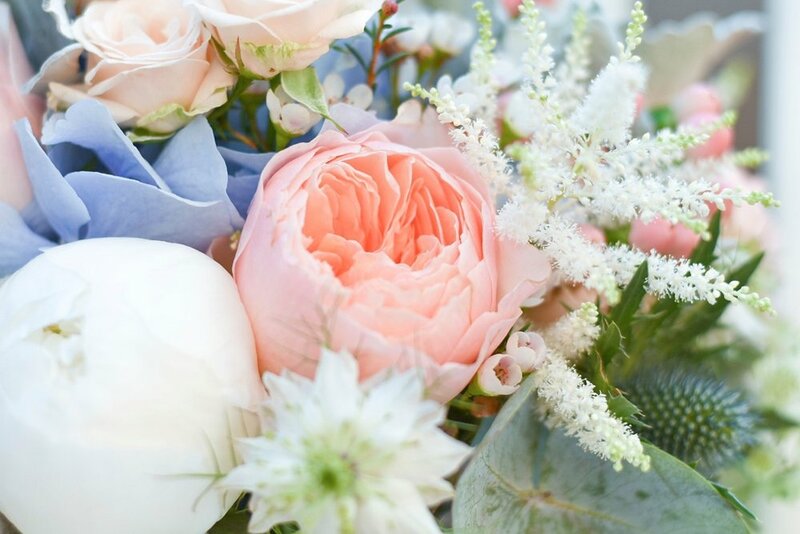 Your florist will be experienced in coaxing peonies into beautiful life, and everyone has their own little tricks of the trade to keep them looking plump and gorgeous. My personal top tip is to wrap tights or stockings around the flower to help it keep its lovely globe shape. If possible, I also keep them in a cool, dark place until they’re needed. This gorgeous little pink number was a cheering sight in my studio for a week. I shot it each day, opening up to reveal its inner loveliness. So thank you, peonies for brightening up my work and my life this summer! I’m starting to look forward now and can’t wait to get stuck into some lush late summer and autumnal colour. Stay tuned for a showcase of some of my recent work, and some details of the lovely weddings I’ve been involved with this year.